Faster than a speeding bullet, when she thinks her child is in danger. More powerful than a locomotive, when she has to carry a 5 year old to bed. Able to do anything with a single hand. It's a bird. It's a plane. 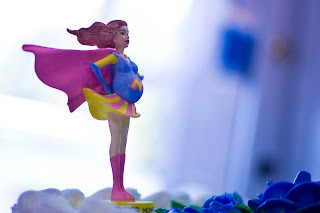 It's supermom! When a woman becomes a mom, she inherits battle scars and superpowers. These superpowers allow her to take the best care of her family and each subsequent birth levels up these superpowers. 1. The One-Handed Warrior. Moms can do anything with one hand. This magical multi-tasking ability comes in handy when mom has to comfort a crying baby, cook dinner, fold laundry and corral a toddler all at once. We've gone to the bathroom while breastfeeding more times than we'd like to admit. 2. Ability to Find the Needle in the Haystack. This comes in handy every time the baby loses her pacifier, the child loses his favorite toy and dad just can't find where he put his keys. Supermom can find all three in record time. 3. Bionic Hearing. Mom hears everything. A cough in the middle of the night will send a mom flying to her feet to check on her little one. There's a reason she needs her coffee in the morning. 4. The Human Polygraph. She knows when you're lying just by looking you in the eyes. She can pick up on every little nuance and can call your bluff with 99.9% accuracy. 5. Death Stare. One look. That's all it takes for you to know you had better stop whatever it is you're doing this instant or there are going to be some serious consequences. 6. Healing Powers. With just a kiss or a hug, moms can cure whatever ailment their little ones are suffering from. Whether it's a skinned knee or a broken heart. Mom is there and she can soothe. 7. Psychic Abilities. Mom knows when you're in danger. She also know when you're playing in your room instead of cleaning it like she told you to. Mom knows all. 8. Super Strength. Mom can carry a car seat with a 20 lb baby, over-stuffed diaper bag and an arm full of groceries into the house all at once. 9. Stomach of Steel. Dealing with poop, blood, vomit and pus is just a part of the job. Though at one time they may have sent mom running to the bathroom, bodily fluids have no longer effect her stomach of steel. 10. Dinner Time MacGyver. There are only a couple stale crackers, a half empty bottle of mustard and hot dog in the kitchen, but somehow mom can make a meal that's delicious and nutritious.